We took advantage of yesterday’s sweltering temperatures (50 degrees!!) to play and work outside. 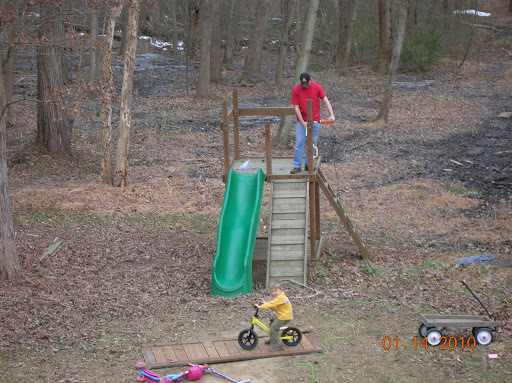 Down comes the swing set. My husband is insisting this is it’s last move. I’m just happy we’re having this heat wave. Last week’s bitter cold (OK, nothing like the Midwest, but once you get below freezing and the wind is howling, cold is cold) had me concerned that my husband would abandon the swing set altogether. I didn’t even like going from the house to the car, so there was no way I would make him work outside for hours. One final jump. 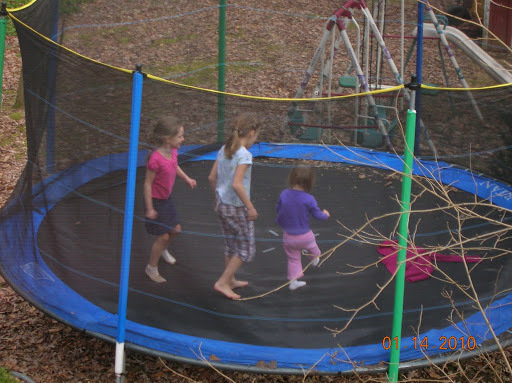 Trampoline comes down today. Notice the very non-wintery clothes. It was hot, I tell you. Well, not me. I was wearing a sweater. Kids, though, seem to have different thermostats. 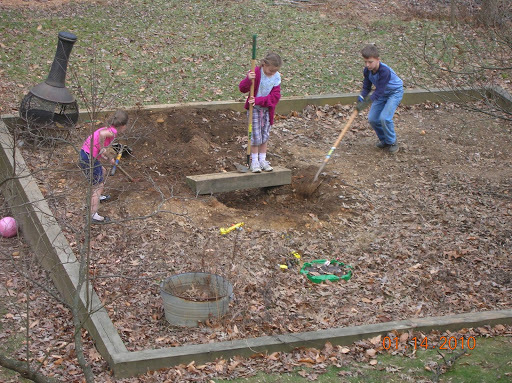 Un-excavating the raised garden that I never filled with vegetables. Little boys feeling the enormity of the task. 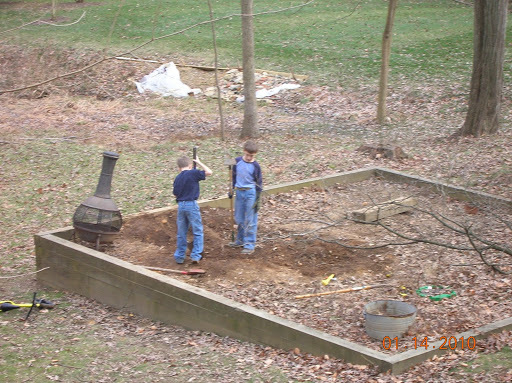 These boys zealously spent hours digging a bunker in the garden. I told them they could, but they’d have to put the dirt back before we moved. Now that it’s time to fulfill the promise, digging is no longer such a fun job. Every five minutes they would ask if they could have a break. Admittedly, the job is a little harder this go round. The ground isn’t frozen, but it sure is hard. I spent a few minutes manning a hoe, chipping away at the mounds. Then I decided I had better things to do. Besides, I didn’t make the hole in the first place. Temperatures are expected to remain above freezing, even at night, for the next week, so hopefully the job will get easier. This entry was posted in home life, PCS. Bookmark the permalink. I know the feeling – temperatures dropped to 58 here yesterday and I had to put on LONG SLEEVES. I thought I had looked closely at the pictures on your sidebar of all your children, but for some reason I don't think I noticed the one of Peter until now. That kid is just too cute (they are all really cute, but he has a darling impish cuteness). Give him a cookie! We were warm down here in GA, too! So nice after our FREEZING weather. We had ice on our driveway for over a week. Very unusual. good luck with the move!